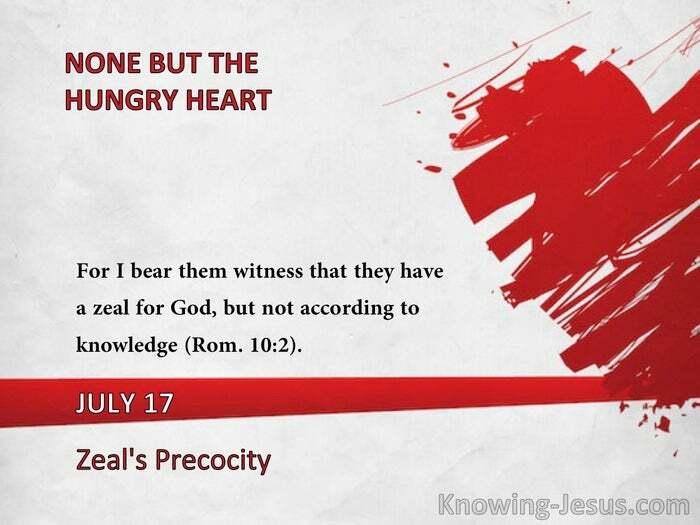 For I bear them witness that they have a zeal for God, but not according to knowledge" (Rom. 10:2). It takes more to break inertia than to ease momentum. Misdirected zeal is more easily corrected than inert sloth. "It is possible, and very humiliating, to be awakened to the fact, though we have had a measure of zeal for the Lord, that we have barely known the things we should have known, nor the behavior that is becoming to us in this marvelous day of grace. "But it is the love of the Lord Jesus that would lead us on, through the judgment of ourselves and ways, into deeper communion with Himself to be better representatives of Him here in whose likeness we shall soon appear." "The snare with zealous, but unprepared and unbroken hearts, is to do the right thing in the wrong way. It is not enough to know the right thing, but I must know the right way of doing it. The latter is not easily learned; the former is the fruit of light; the latter is never acquired but as there is practical grace and love - the activity of the Lord Jesus' nature in me by the Spirit." -J.B.S. "Denial of the old man is where he is most felt, not where he is least felt; and all the light of Scripture cannot promote growth without self-denial. Here is where most fail, and in this day there is a great deal more zeal to acquire knowledge and intelligence in the wonders of revelation, than to deny the man that has no sympathy with it, nor part in it, but condemnation." 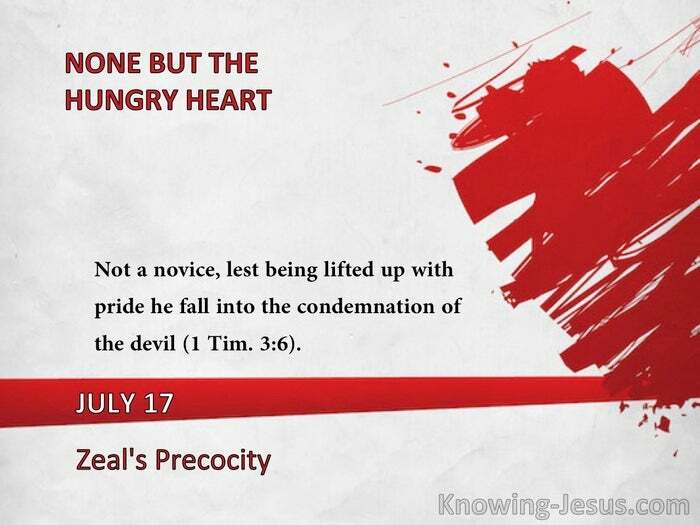 "Not a novice, lest being lifted up with pride he fall into the condemnation of the devil" (1 Tim. 3:6).